The Uji area in Kyoto has been a famous green tea production center. Matcha is powdered green tea and, is used in various foods, especially in a wide variety of popular sweets. Many of them keep for a long time, making them great gift ideas as well. Matcha Kit Kat has been very popular and You can find them everywhere in Japan. This special Kit Kat wafers are coated in select matcha-flavored chocolate, created in collaboration with a famous tea shop from Uji. This is only available in Kyoto. Two langue de cookies with the robust flavor of matcha and a slice of white chocolate sandwiched in between create a superb balance of bitter and sweet. Sold exclusively in Kyoto. This fluffy baumkuchen is made using mild soy milk produced in Kyoto and supreme fragrant matcha from Uji. It is sold exclusively at the Hanami-koji shop. Bitter sweet matcha smoothie with a crushed Yatsuhashi cracker for a crispy texture. It is topped by sweet red-bean paste, whipped cream and soft unbaked Yatsuhashi. This cafe is very famous for its parfaits. 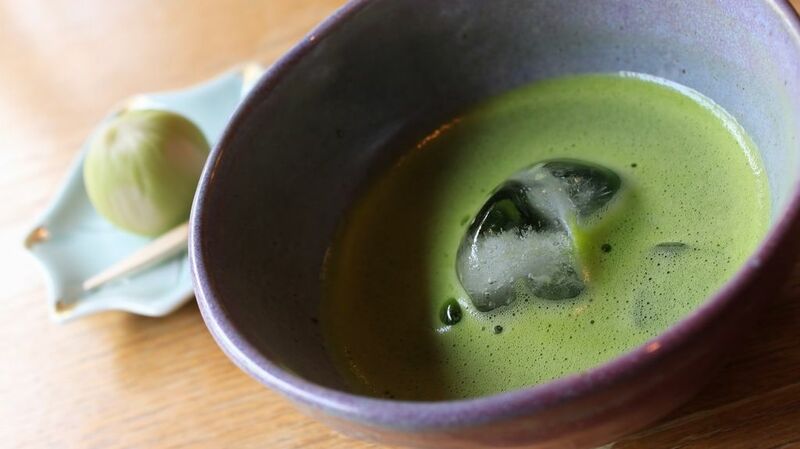 There is all the matcha you could want, from the ice cream to topping that include matcha-flavored castella sponge cake, jelly and whipped cream. Warabi-mochi are particularly soft, pleasantly bitter dumplings with matcha kneaded into the dough.Eat with some dark molasses and a sprinkling of tasted soy bean flour mixed with more matcha.